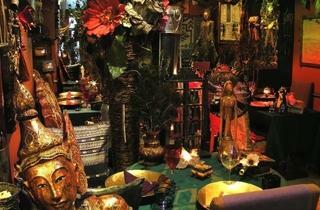 Exotic food seldom seen on most menus is the draw at this slightly eccentric spot just down from Warren Street. The decor - a mismatched mix of fertility idols, giant peacock feathers, golden Buddhas and intimidating masks - is perhaps as adventurous as the food. There's certainly a lot to look at. The unconventional food features marinated kangaroo skewers, jerked alpaca, crispy zebra jerky, pan-fried crickets and crocodile wrapped in vine leaves with honey-poached plums and pickled samphire. Mexican pork belly, a chicken massaman curry and Berber spiced lamb are some of the more conventional choices. The wine list follows this more traditional route, with an old world slant punctuated by a few bottles from the new. There's also a bit of extravagance - a 1961 Petrus is down in the cellar. Meals served 8am-10pm Mon-Sat; 10am-8pm Sun. Archipelago is definitely one of my favourite restaurants in London! Can be a bit pricey but so worth it!! First of all the venue looks amazing. As soon as you walking, the travel to far far away islands begins. Then the food, first of all it is pretty surprising (expect snake, zebra, crocodile, bugs etc...) and on the top of that, it is tasty! I visited the restaurant a few times and I would highly recommend the crocodile in vine leave or the zebra jerky, the alpaca (picture below, absolutely mind blowing) and of course the curry ice-cream. The staff is always happy to recommend things, chat a little and they are simply adorable. If you ask me, this place is most definitely a must see. A lot of people say this place is somewhere ‘you must try once’, but this is my second time here and I can’t wait to go back! The adventure begins as soon as you enter: if you book a table, you’re given a “secret password” you have to say on arrival in order to be shown to your seats. You look around at the slightly chaotic mix-match decor... what have I got myself into? Stick with it. Once seated, you’re presented with your food menu stuffed in a treasure chest and wine list in the form of message-in- a-bottle, followed by a “magical” hot towel that expands in rose water. I stared at this button-size towel for a while not knowing whether to eat it, smell it or just look at it. Surrounded by African masks, wood carvings, animal paintings and little trinket treasures, you feel as if you’ve unsuspectingly become part of a Pirates of the Caribbean set. If you come here after dark, the atmosphere is even more magical with twinkling candles all around. The food is, well, different. But that’s what you’ve come here for, right? I’m making my way through the menu (including the crickets, which aren’t as bad as you think!) and I’d hands-down recommend the “jerky” zebra or python (image below) for starter, the bison steak for main and, finally, Pharaoh’s treasure for pudding. Having said that, everything I’ve tried on that menu, no matter how creepy it sounds, is delicious. Think weird and wonderful. Think crazy foodie adventure. If you want to impress on a first date and give him/her something to tell their friends about, then this is the place for you. Beware though: it isn’t particularly kind to your wallet! This was the craziest place I have ever been to! I tried snake, zebra, kangaroo and also crocodile! For dessert I had caramelised worms! its definitely a place to try once and the atmosphere is really amazing! Great service too! This is a place I have known of for years but never previously ventured into. Got a deal through Time Out which made a visit much more reasonable on the finances so finally popped along. Inside feels like you are stepping into the set of some exotic and slightly creepy teen horror story. All dark carved wood and gathered trinkets. Very good scene setting. The food is exotic indeed. We had crocodile wrapped in vine leaves, python carpaccio (not to our liking), and zebra jerky (tender and with a wonderful flavour - surprised and delighted) to start followed by shredded alpaca alongside kangaroo skewers (superb!) and the honey ice cream (with honey steeped bumble bee on the side - I wasn't brave enough to eat this) to end. I was pleasantly surprised by many of the meats but for me that was a visit-once-and-now-I-am-done place so I have no plans to return. Would certainly be a talking point to take a first date though! Great experience but you have to have brave tastebuds. We tried python and zebra, as well as bison. There were also ants on the menu, as well as a lot of other random things! I loved the jerky, and so did my partner. She really liked the python carpacchio but I wasn't as sure! The bison steak was great, as were the blue potatoes! My friends and I bought 3 vouchers on Time Out Offers for a three course meal with a glass of prosecco for £25 each (rather than an average of £42) I had wanted to try Archipelago for ages, especially after enjoying a meal in Cambodia last year in a place called The Bug Cafe which, as you could imagine, hosted a menu of all things creepy and crawly but prepared in a gourmet manner. Most of the dishes in that meal had been delicious and so I was keen to try more exotic and unusual dishes. I had pondered over the menu all afternoon at work and decided that this was my opportunity to try a few interesting meats rather than go for the buggy dishes. We all ordered the Zebra starter - Crispy zebra "jerky", boerewors, carrot & ginger fluid gel and biltong soil. It was outstanding. The zebra was tender and juicy and very reminiscent of chinese ribs. There was a sweetness in this dish and I loved it. For my main I chose to enjoy the Zhug marinated kangaroo skewers, with candy beetroot & guindilla salad and red onion farofa - also a very delicious dish, and VERY filling (especially as we ordered a side of rice which was coconutty and soft) but the meat definitely wasn't as succulent as the zebra. If we could have swapped these around and had a smaller skewer starter and a larger zebra main that would have been dreamy! For dessert I naturally leapt at the chance to order the chocolate souffle with white chocolate and CURRY ice-cream though I was slightly disappointed when it arrived - this was not a souffle, rather it was chocolate fondant without a runny middle. It was delicious, but it was not a souffle. The ice-cream is super rich and indulgent- super creamy and very sweet and a little too sickly (though I did scrape the plate clean) but I struggled to taste the curry flavours. The service was really attentive and friendly, though the booking process was a little bit painful. Before they could confirm my booking I had to send each of our voucher numbers through and the security number and then you also need to print off the voucher and take it in when you fine... I mean, ok but if you're getting the voucher when we dine, why do you need all the info before hand. Coordinating my friends to go out to dinner together is hard enough without having to get all their voucher details before hand too! But hey, i'm being picky! Crickets, bees, python, crocodile, kangaroo, bison, and more. What a wonderful restaurant, if you're willing to try the more unusual foods out there. Go with an open mind and don't be afraid to try the delights on offer. Regarding drinks, the wine is very reasonably priced and there are a number of cocktails to choose from. The setting is similar to a museum of curiosities, with something wonderful to examine in every nook and cranny. Bijoux, from the venue to its many adornments; the identity of which you can muse over whilst soaking in the relaxing atmosphere.The variety of dishes -some of which in the UK are considered exotic- provide an intriguing menu. Our starters comprised of crocodile with samphire and a tangy plum sauce -absolutely delicious. On to the main, I opted for the bison steak (which put even the best quality beef steak to shame in comparison) and was delighted at the skillfully crafted bubble of accompanying herb butter. My partner opted for the Kangaroo skewers; delicious and perfectly cooked. They have a very decent wine list, but do take up the chance to sample one of their cocktails, too. You won't be disappointed. The staff were attentive, yet not overbearing: Glasses remained filled and our meals and the ingredients were described expertly. There are vegetarian dishes, as well as meats such as chicken, for the less adventurous, thus catering for a variety of palates. 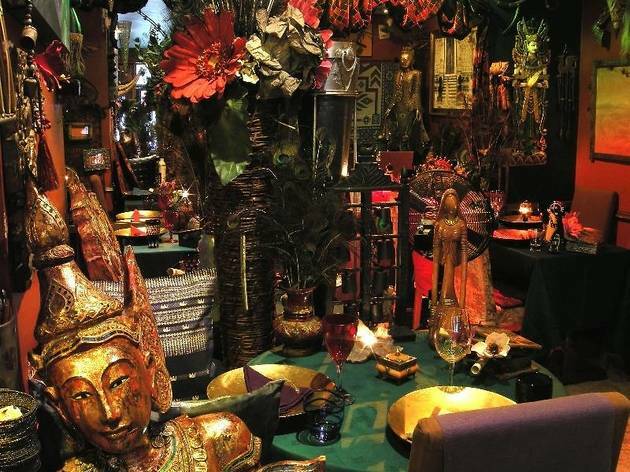 This tiny restaurant is an Aladdin's cave stuffed with Buddhas, trinkets and treasures from around the world. Set against dark walls and in low light the atmosphere is exciting but tranquil. Our waitress was friendly and attentive and very happy to recommend dishes including the Lovebug Salad (crickets and locust) which I can proudly say I eat and actually really enjoyed. We also had zebra, bison, alpaca and crocodile, all of which were beautifully served and had great flavor. The exotic nature of Archipelago is of course its major draw but it is not fallen into the trap of being just a gimmick, the food is good quality, interesting and really tasty. Things may have changed recently in terms of reservations, I booked in advance and was given a password to get into the restaurant but there was no need to give any card details before hand.